Episode 16 - This is the final installment of the "Krishna Episodes", where I've covered Krishna's back story up to and beyond the point when the Pandavas met him in Panchala. 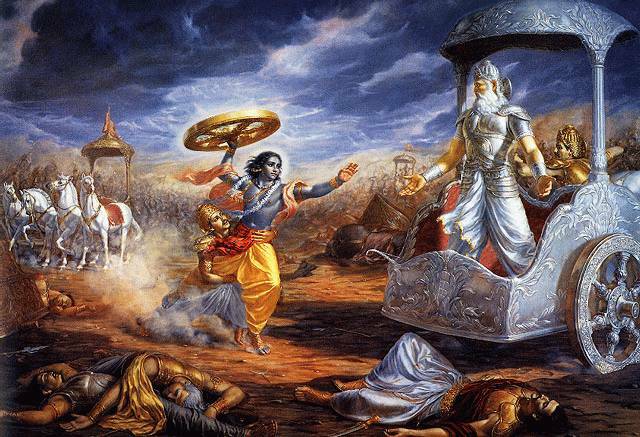 There are still some interesting details in the Bhagavata Purana which I want to compare with later events in the Mahabharata, so I'm not completely done with that book, but for the upcoming episodes, we'll get back to the Mahabharata and see what the Pandavas do next. I have to apologize for narrating this one kind of fast. I guess I just had a cup of coffee before I got started, because I did some fast talking. Next time I'll make it a glass of wine, and I promise I'll slow down a bit, as was suggested to me in one of the comments! I would just like to say that I have always found Indian mythology interesting but dense and hard to really learn about. Especially with no common words or reference points to make the names easier to keep straight. Thank you very much for this podcast, it is awesome and I am loving it. Apparently, Radha is not mentioned in any of the texts because talking about Radha would distract the audience from Krishna. Her beauty and significance would just interest the audience too much, getting them distracted from the storyline.